The above info came from atomofish, and was edited by yours truly (contact me). The image came from evamonkey. In the second film of the Rebuild of Evangelion Saga we are introduced to the pilot of Eva Unit 02, Asuka Soryu Langnley and a newcomer named Mari Makinami. As members of NERV they continue to fend of the assault of the Angels by using the power of the Evangelions. However, a new mystery arises in the form of SEELE's mysterious new project, Eva Unit 06. Another Eva Unit is being developed in America, and ends up being piloted by one of Shinji's closest friends. 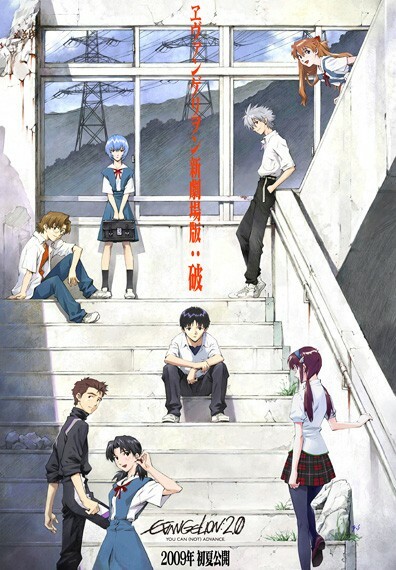 However, tragedy arises during the testing of the new Unit, and the EVA Pilots are forced to fight for their lives. The second movie once again retells the story of Evangelion, but also brings a lot of new and different twists in the process.